Just in time for Valentine's day, here comes a super easy recipe that has the heady intoxication of love and happiness. 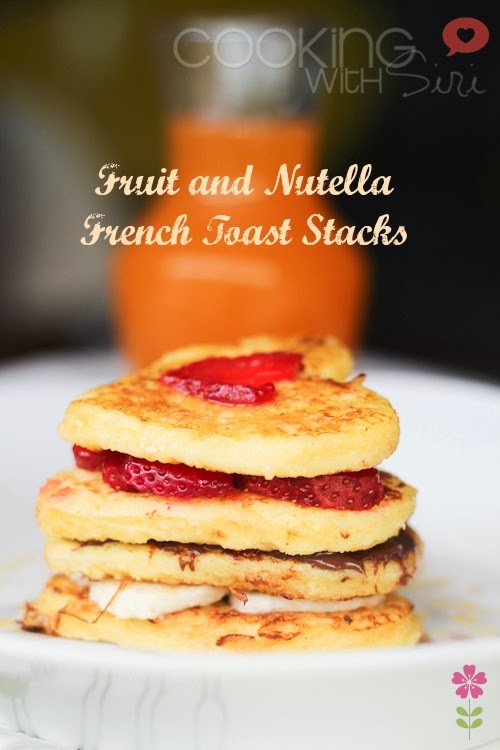 Learn how to make french toast recipe, stacked together and filled with tons good stuff like bananas, strawberries and nutella. It cannot get better than that! Same recipe can be made as a savory treat or can be served with jam. Make these love filled stacks for your dear ones and watch them say "Fruiticilious!" at every bite. ..ready to be dipped and shallow fried.. This has to be my most favorite way of eating a french toast. Easy to make and fun to bite into, the beauty of this recipe is its simplicity and can be adapted to the flavors you like. So, if you don't have bananas, just serve strawberries + nutella; No nutella you say? stack with just bananas; No fruits in the fridge? layer with whipped cream or cream cheese; If you don't have a cookie cutter, just make french toast with regular bread and stack them. It is as simple as that. It is quick and one such recipes which surely make everyone fall in love with you! Enjoy! eat as-is or stack them! ..it has all the colors of love.. Using a heart shaped cookie cutter, cut hearts from each bread slice. Whisk together - egg, milk, cinnamon and sugar. Heat a small dot of butter on a pan. Dip each bread slice in egg mixture. Cook on medium heat until golden brown on each side. Transfer to a plate and cover to keep warm. Repeat the same with all bread slices. Layer each toast alternatively with nutella, bananas and strawberries. Drizzle with honey or maple syrup. Serve warm. These look super cute and awesome! Looking so pretty hearts !